Last week, almost three years after being diagnosed with stage four endometrial cancer, the latest CT scans of my chest, abdomen, and pelvis came back clean as a whistle. The study result indication said, “History of endometrial cancer.” I read the phrase three times before it sunk in, and I wept tears of joy. The news doesn’t get any better than this, but it’s hard to stop looking over my shoulder to make sure the cancer is not trying to catch up with me. I’ll be happy if I can resist turning my head a little less each time. I am certain that I beat the odds because I found a very gifted and dedicated young surgeon, who settled for nothing less than a win. When she opened me up and saw I was riddled with cancer, she rescheduled her remaining surgeries for another day and worked on me for eight hours until she had removed every bit of cancer she could. Chemo would take care of the rest. My toe nails to jump ship. An angry, itchy, painful rash on the top side of my hands. My hair to fall out in the shower on New Year’s Eve, just as friends arrived at our door. Numbness and tingling in my feet, which remain to this day. Through it all friends and family stayed by my side and assured me I’d be fine. There are no words to express my gratitude. Every spring, when the tulips pop their heads up from the ground, I am reminded of the surgeon who gave me a second chance at life. Because of her I saw the birth of my beautiful granddaughter, been a strong presence in her life and published my book. Through both, I touch many lives and pay my gift of life forward. This post touched my heart and brought me to tears. Congrats! Knew you would do it! We are so happy for you. God Bless you. 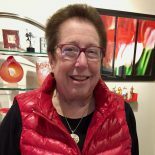 This entry was posted on April 20, 2018 by mydancingintherain in Back to Normal, Cancer, Family Life, Friends, Neuropathy.